GettyPresident Barack Obama and his dog Bo were very close. 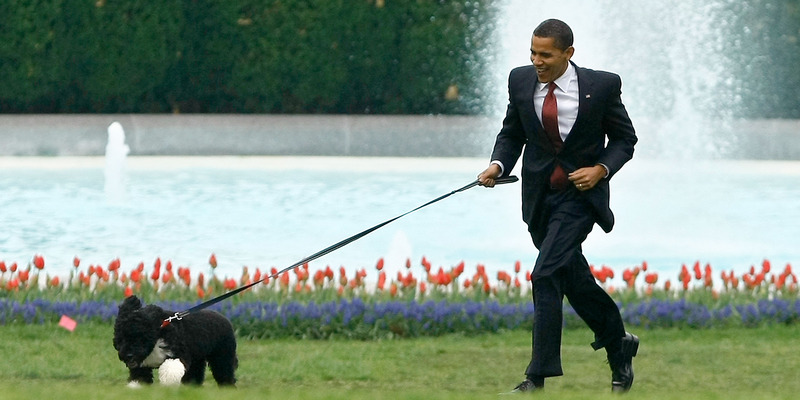 Dogs have been the most popular pet for a president to have during his time in the White House – 30 of the 44 presidents have had at least one dog in the West Wing. Warren Harding’s terrier, named Laddie Boy, was six months old when he moved into the White House. Calvin Coolidge’s collie Rob Roy was named after the popular cocktail. 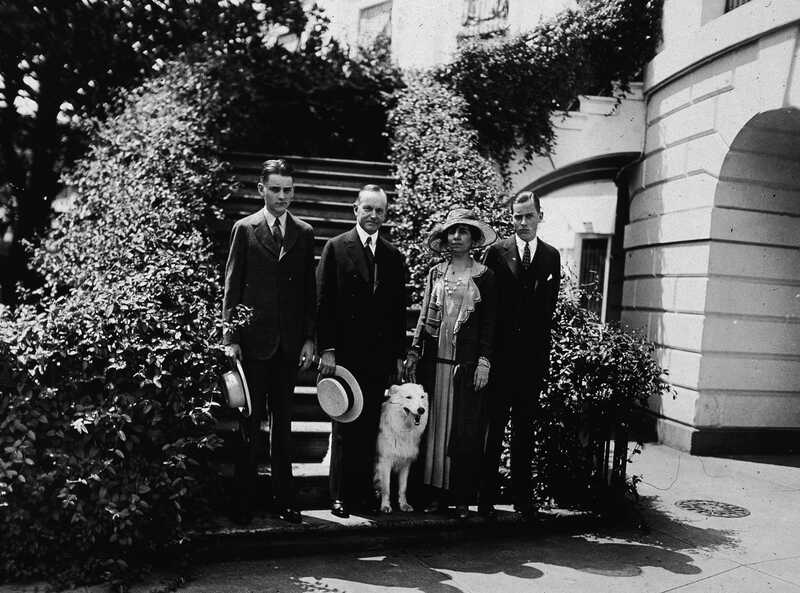 Hulton Archive/Getty ImagesPresident Calvin Coolidge stands outdoors with his wife Grace, their two sons, and their pet white collie Rob Roy in the 1920s. Herbert Hoover had a Belgian shepherd named King Tut, who would patrol the gates of the White House on a nightly basis. He also helped Hoover get elected, appearing in a campaign photo. Franklin Roosevelt’s German shepherd, Major, used to chase the White House maids around. FDR also had a Scottish terrier named Fala that would often accompany the president on his travels. Harry Truman gave away his dog, a cocker spaniel named Feller, to a family physician because he was not a dog lover. Soviet leader Nikita Khrushchev gave John F. Kennedy a dog named Pushinka as a gift. Other than Pushinka, JFK had eight dogs, including his German shepherd named Clipper. Two of Lyndon B. Johnson’s beagles, Him and Her, were frequently on the receiving end of the president pulling their long ears. One of Lyndon B. Johnson’s beagles named Kimberly was given to his daughter Luci. Luci also got another one of his beagles named Freckles. LBJ found his fifth dog, a terrier mix named Yuki, at a Texas gas station on Thanksgiving in 1966. Richard Nixon’s three dogs were an Irish setter named King Timahoe, a poodle named Vicki, and a terrier named Pasha. Gerald Ford and his daughter Susan had a golden retriever named Liberty. Susan got Liberty as a surprise for her father when she was a puppy. Years later, Liberty had nine puppies of her own. Jimmy Carter had a border collie mix named Grits that was born on the same day Carter was elected president. Ronald Reagan had two White House dogs. The one seen here was a Bouvier des Flandres named Lucky that Nancy Reagan received as a gift in 1984. Reagan’s other dog in the White House was a Charles Spaniel named Rex. George H.W. Bush had two Springer Spaniels, Millie and Ranger. Bill Clinton named his chocolate Labrador retriever Buddy after his great-uncle. 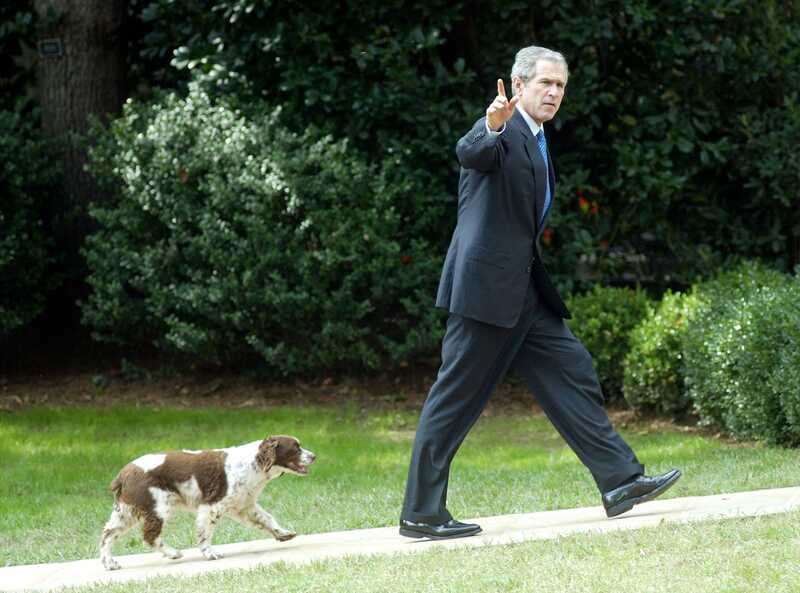 George W. Bush and his first dog in the White House, an English Springer Spaniel named Spot, was one of Millie’s puppies. Alex Wong/Getty ImagesPresident George W. Bush waves as he walks toward the Oval Office with his dog Spot September 23, 2002 in Washington, DC. 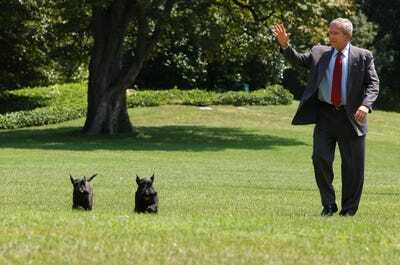 Bush also had two Scottish Terriers named Barney and Miss Beazley, who were separated in age by four years. Evan Sisley-Pool/Getty ImagesPresident George W. Bush waves as he arrives on the South Lawn of the White House with his dogs, Barney and Miss Beazley, August 13, 2006 in Washington, DC. 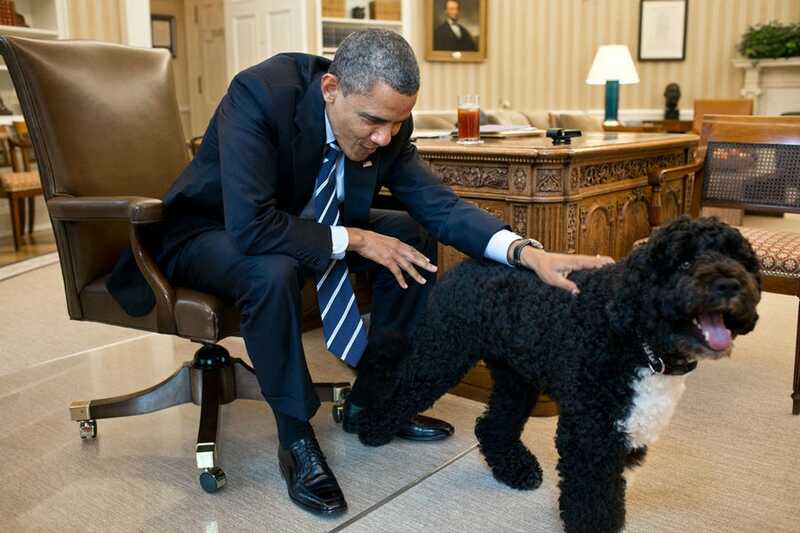 The Obamas had two famous Portuguese Water dogs named Bo and Sunny. 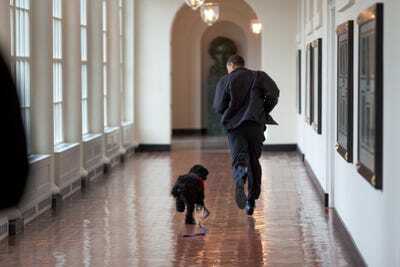 Bo often exercised and played with the president. Official White House Photo by Pete SouzaPresident Barack Obama runs down the East Colonnade with family dog, Bo, on the dog’s initial visit to the White House, March 15, 2009. Bo came back to live at the White House in April. 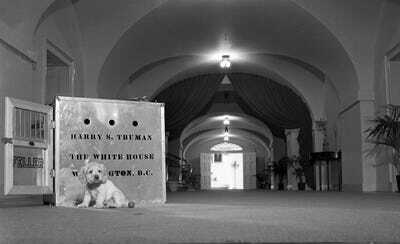 Bo and Sunny were so popular that they apparently had official White House schedules for all of their appearances. President Barack Obama and Bo in the Oval Office. Donald Trump bucked White House tradition when he went two years in office without a dog. 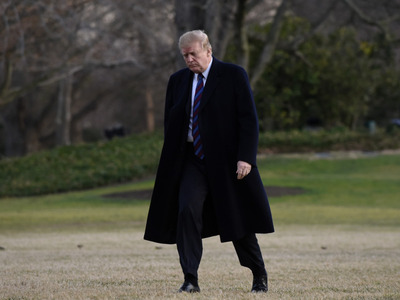 Olivier Douliery-Pool/Getty ImagesTrump returns to the White House after receiving his annual physical exam at Walter Reed National Military Medical Center on February 8, 2019 in Washington, DC.